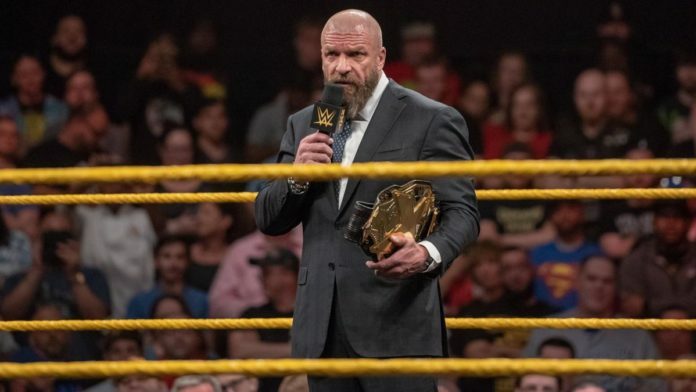 WWE COO Triple H came down to the ring with the NXT Championship. 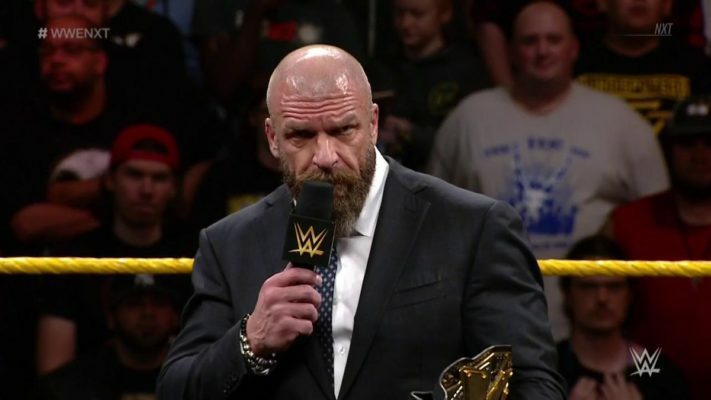 Triple H said that NXT is something special because it is where dreams can become possibilities. He stated that the main event of TakeOver: New York was going to be a match years in the making, Ciampa versus Gargano. However, reality has dictated that Ciampa needed neck surgery and has had to relinquish the NXT Championship. Triple H said that when one dream ends, another one begins. Gargano will go to NXT TakeOver to face the winner of Ricochet vs. Adam Cole vs. Aleister Black vs. Velveteen Dream vs. Matt Riddle. Triple H added that the match at NXT TakeOver: New York will be 2 out of 3 Falls. Adam Cole, Ricochet, Velveteen Dream, Matt Riddle, and Aleister Black battled in a Fatal 5-Way on this week’s episode of NXT. The winner of the match will go on to face Johnny Gargano at NXT TakeOver: New York for the vacant NXT Championship. Riddle, Cole, and Black were quickly knocked out of the ring to start off the match. Velveteen and Ricochet traded shots for a bit and Dream set up for the Death Valley Driver. Aleister broke it up with a kick to the face and then was brought back to the outside by Adam Cole. Back in the ring, Matt Riddle connected with three Gutwrench Suplexes in a row on Ricochet. Black and Ricochet shook hands and teamed up on Cole. They went to battle each other but Cole hit Ricochet from behind and Ricochet fell into Black, sending Aleister tumbling out of the ring. Cole then hit Ricochet with a Neckbreaker for a near fall. Dream took out Cole and Ricochet but then turned around into a German Suplex from Riddle. Matt locked in the Bromission on Dream but Aleister broke it up. Cole brought Black back outside the ring and launched him into the steel steps. Matt Riddle and Cole then traded words in the ring and started trading shots. Riddle got the upper-hand and locked in the Bromission but Velveteen Dream once again broke it up. All five Superstars battled in the corner and wound up planted Ricochet with a ridiculous Superplex. Aleister connected with a German Suplex on Dream and bridged into a cover but Riddle broke it up with a Senton. Cole blasted Riddle with a Superkick and then a Neckbreaker over his knee. Cole hit back-to-back Superkicks on Ricochet and then went for the Last Shot but Ricochet avoided it. Ricochet planted Cole with a Reverse Hurricanrana that sent Cole out of the ring. Riddle locked in the Bromission on Dream this time but Adam Cole pulled the referee out of the ring. Aleister connected with Black Mass on Riddle but then turned around into a Dream Valley Driver from Velveteen. Dream made his way to the top rope but Ricochet hit him with a Hurricanrana that sent him flying onto Aleister outside the ring. Ricochet followed that up with an awesome Shooting Star Press onto Riddle. As Ricochet went for the cover, Adam Cole hit him with the Last Shot for the pinfall victory. Adam Cole will now face Johnny Gargano in a 2 out of 3 Falls Match for the NXT Championship at NXT TakeOver: New York. After NXT went off the air, The Forgotten Sons attacked Aleister Black and Ricochet. Those two teams will battle next week in the finals of the Dusty Rhodes Tag Team Classic Tournament. The winner of next week’s match will square off against War Raiders for the NXT Tag Team Championships at TakeOver: New York.